Ms. Potthoff has many tools to use to encourage learning in her 1st graders. At St. John Paul II, we have high expectations for our scholars. We expect them to progress toward and past grade-level proficiency. We help them recognize themselves as beloved children of God. We help them to understand their emotions and how to relate to others in the world. We believe that each of our scholars is a beloved child of God filled with many gifts and talents. Our mission is to foster academic excellence in all areas of study. Our curriculum is built on national and state standards and reflect best educational practices. Our primary and Middle School teams collaborate to provide individualized instruction that builds off the strength of each scholar. We use the data provided by the NWEA Map Growth scores as well as both formal and informal classroom assessments to pinpoint student growth and areas of learning. 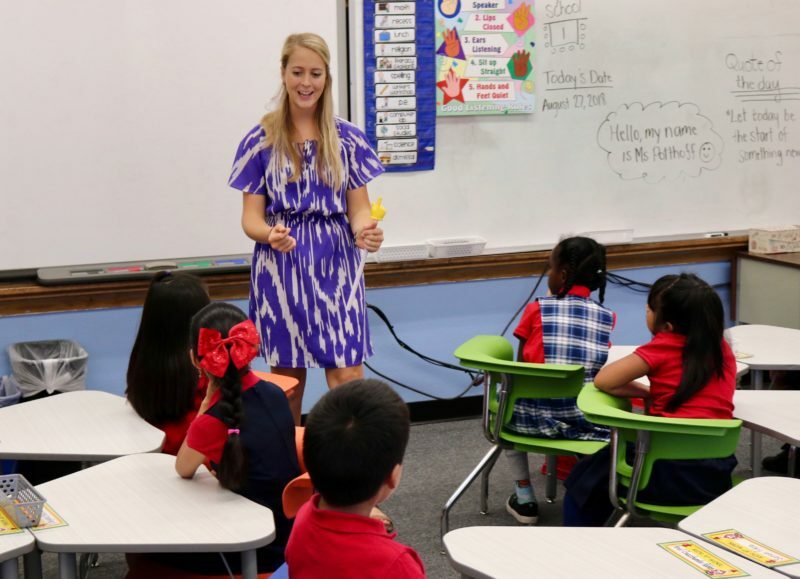 Our small class sizes allow instruction to be tailored to meet these identified needs. Our curriculum incorporates technology skills that enhance the learning experience. Scholars utilize technology in all areas of their learning either through the use of Chromebooks, iPads, the Mac Lab or the interactive whiteboard tools. At St. John Paul II we understand that although technology is not the driver of education it is an important tool that helps to facilitate learning. The Top 20 Program gives scholars — and our staff members — tools for social-emotional health. It reinforces positive mental habits such as gratitude, persistence and curiosity and works to eliminate worry, complaining and boredom. A positive view on life and are focused on what is important. Power to control their lives. Top 20 learning is part of St. John Paul’s commitment to educating the whole child. The positive mental habits scholars are developing will serve them throughout life.